Organic Herbal and Goat's Milk Soaps - Soon! 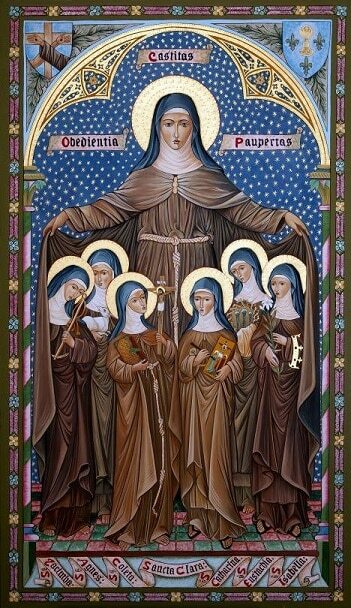 By using the Donate button below, you can help support the monastery, and our cloistered contemplative way of life. May God reward your kindness and generosity! PLEASE READ CAREFULLY: All available items are shipped within the United States ONLY. At this time we are not able to ship to any countries outside the United States. All offerings must be in US Dollars only; foreign currencies cannot be accepted. No Returns, Refunds, Credits, or Exchanges - Available items are prayerfully and carefully prepared BY HAND (not mass produced on machinery) in our Monastery. Preparation time for ALL badges - AGNUS DEI and all RELIC BADGES - is now SIX (6) WEEKS (sometimes shorter, sometimes longer - depending on the number of requests at the time your request arrives.) Preparation time does NOT include time in transit (USPS) from our monastery to your home. Please be advised that illness, injury, weather-related operating computer / printer problems and repairs, etc. may also cause unavoidable delays in preparing items. Thank you for your kindness, patience, and understanding while your sacred items are being prepared just for you! God bless you! Email us - Reginacoeli1620@gmail.com with any prayer requests or questions. Prayers are prayed each day for all who have emailed their prayer requests - and for the Church, for the world, and for all family pets and companion pets, especially those who are older and may be sick. Dogs are a special part of the monastery, and they enrich the daily monastic life with their presence. If you have a pet in need of prayers, please email the monastery with your request. The blessed wax that you will receive in these AGNUS DEI is authentic, very old - blessed by His Holiness, Pope Leo XIII in 1878 (from the first year of his Pontificate, and over 135 years old), very fragile, and very rare! Those who carry or venerate the AGNUS DEI are promised protection from tempests, lighting, fire, water, malice of demons, adversity, pestilence, sickness, and sudden death. It protects women bearing children that they may be preserved from all harm and are favored with a happy delivery. The Requested Offering helps with the materials, in-house printing, and packaging costs of the AGNUS DEI sacramentals and enclosures - the blessed wax is a GIFT. All AGNUS DEI sacramentals are prepared by hand in our Monastery, so please allow at least SIX (6) WEEKS to prayerfully and carefully prepare your Agnus Dei. All dollar amounts in each drop-down window for the Agnus Dei Sacramentals are Requested Offerings for the quantity you select. PayPal template buttons allow a minimum of text, so this cannot always be specified for each PayPal button. Locket Medal (gold gilt colored) The AGNUS DEI locket-medal is specially made to hold the blessed wax and is imported from Italy. The enclosed booklet explains the history of the AGNUS DEI and the graces associated with this sacramental. Also enclosed is the traditional prayer for those who carry an AGNUS DEI. Each is prepared by hand especially for you so there are No returns, credits, refunds, or exchanges allowed. 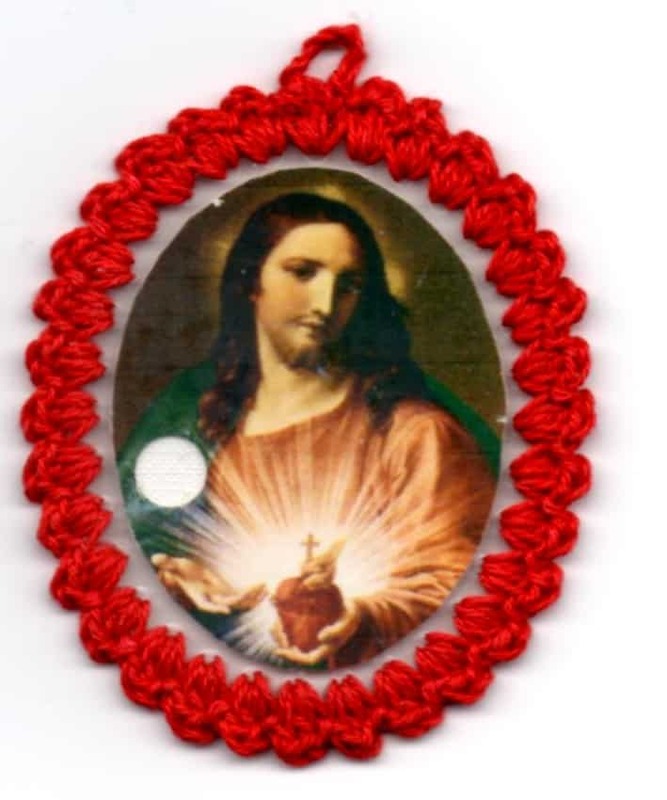 Full-color badges - traditional holy pictures - beautifully crocheted by hand in our Monastery. Actual size of finished OVAL badge is approximately 2½" x 2". ALL badges are oval (rectangular-shaped badges have been depleted). A small piece of the blessed wax is visible on the reverse side of the badge. Enclosed is the prayer for those who carry an AGNUS DEI, and the booklet containing the history of the AGNUS DEI and the graces associated with it. Jesus with Lambs; Immaculate Heart of Mary; My Mother, My Confidence; St. Gerard Majella (Patron of Mothers); St. Joseph; St. Francis of Assisi; Most Sacred Heart of Jesus; Most Precious Blood of Jesus; St. Gertrude the Great; Our Lady of Mount Carmel; St. Therese - Little Flower; Our Mother of Perpetual Help; St. Clare of Assisi; St. Colette; Most Holy Trinity; Guardian Angel; St. Anthony of Padua; St. Michael the Archangel. Please specify which holy picture(s) you would like. If one is not specified, a holy picture of our choice will be sent to you. Each is prepared by hand especially for you so there are No returns, credits, refunds, or exchanges allowed. Sorry! The large Agnus Dei is NO LONGER AVAILABLE. Supplies have been depleted. Lockets and Badges (see left) are still available! Please Note: Please allow at least SIX (6) WEEKS for your Agnus Dei to be prepared. The six (6) week preparation time does NOT include transit time from our Monastery to your address. Relic Badges of the TRUE CROSS: Beautiful full-color pictures of the saints - encased in plastic and beautifully hand crocheted in our Monastery. Actual size of finished relic badge is approximately 2½"x2". Each badge below contains a small piece of blessed linen cloth - visible on the front of the badge - which has been touched to the Relic of the TRUE CROSS of Our Lord which makes it a Third Class Relic - which is a GIFT. Your kind offering helps with the materials used in preparing the relic badges. Each badge is packaged and includes a beautiful matching holy card with prayer. Relic badges may be carried in one’s pocket or affixed to one’s clothing. They may also be affixed to the clothing of the sick or placed in a room. Preparation time (excluding transit time from our Monastery to your address) is SIX (6) WEEKS. Requested Offering: $6.95 each - includes postage. In these times of increasing evil and diabolic disturbance, blessed salt is an absolute must for every Catholic home! Blessed salt can be sprinkled in one's home, across thresholds and windowsills, around property lines, in cars, school lockers or work sites. It can also be used on food, or in cooking. As you spread the blessed salt, pray for Our Lord's blessing and protection. Because of its exorcism and blessing, it is a powerful sacramental in keeping away demons. Requested Offering: $3.50/packet (includes information on Blessed Salt, it's uses, and postage with tracking information). Traditional Examination of Conscience - 18 pages. Compiled from approved sources (1937 and 1949). Requested Offering: $4.25/each, includes postage with tracking information. Chaplet of the 5 Wounds of Jesus Crucified - 8 pages - St. Alphonsus Ligouri. Requested Offering: $3.50/each, includes postage with tracking information. The Mass of St. John - 8 pages - consists of the 3 principal liturgical prayers of the Holy Sacrifice of the Mass - taken from the Missal: Offertory, Consecration, and Communion. Friends and Apostles of the Sacred Heart of Jesus learn these beautiful prayers by heart and acquire the habit of celebrating the Mass of St. of John as often as possible - even many times throughout the day. You can say these prayers during your work, at home, or while traveling. In doing so you will learn to live the wonderful gift of the Holy Sacrifice of the Mass. Requested Offering: $3.50/each, includes postage with tracking information. The Steps of the Passion - 8 pages - St. Alphonsus Liguori. This prayer or blessing is attributed to an anonymous pilgrim priest who in the 13th century visited a convent and church near Lisbon, Portugal, which had been plagued by devastating storms. When the pilgrim priest learned of what was occurring to the convent, he left a written copy of this prayer with the convent’s gatekeeper, then disappeared without a trace. From that time there has never been a storm causing damage there. Subsequently, the prayer was ordered to be published by Pope Innocent III (1198-1216). Private revelation (no obligation is imposed on the faithful to believe them) states that the mysterious pilgrim priest who had given the prayer to the gatekeeper was St. Anthony of Padua. Keep a copy at home and in the car. Requested Offering: $3.35/each includes postage with tracking information. The Forgotten, Highly-Indulgenced Catholic Sacramental - A beautiful silver-colored metal Pardon Crucifix which measures approximately 2” x 1 3/4”. On the back of the Pardon Crucifix is the Sacred Heart with the words "Behold the Heart Which Has Loved Men" and "Father Forgive Them." This crucifix was introduced at the Marian Congress of Rome in 1904, with the support of his Eminence Cardinal Coullié, the Archbishop of Lyons. 1) Whoever carries the Pardon Crucifix will have the privilege to gain 300 days indulgence each day. 2) In kissing it devotedly, one gains a 100 days indulgence each time the Pardon Crucifix is kissed. 3) He who pronounces before this Crucifix one of the two following invocations gains each time an indulgence of seven years and seven quarantines: Our Father Who art in heaven, forgive us our offences as we forgive those who have offended us. 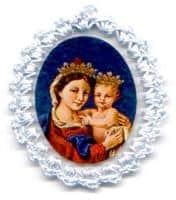 I beg the Blessed Virgin Mary to pray for me to the Lord our God. 4) Whoever, in danger of death, receives the Last Sacraments of the Church, or contrite of Heart (if it is impossible for one to receive the Last Sacraments), shall kiss this Pardon Crucifix and ask pardon of God for his sins and forgives whoever has offended him, gains a plenary indulgence. Requested Offering: $5.95/each (includes postage with tracking information) - History and information on the Indulgences enclosed with each Pardon Crucifix. These Relic Badges are made with handsome color pictures of male saints - each one encased in plastic and beautifully hand crocheted with a contrasting color thread. Handcrafted in our Monastery. Actual size of the finished Relic Badge is approximately 2½" x 2". Relics are visible on the front of each badge. Badges are individually packaged and include a beautiful matching holy card with prayer, or novena prayer booklet, or prayer leaflet. Relic badges may be carried in one’s pocket or affixed to one’s clothing. They may also be affixed to the clothing of the sick or placed in a room. Requested offerings help with the materials for the badges and in-house printing costs. The enclosed Third Class Relic is a GIFT. We invite you to make your selections from the following badges. The blessed cloth in each badge has been touched to the FIRST-CLASS relic of that saint making it a Third Class Relic. Requested Offering: $6.95/each, includes postage with tracking information. The Relic Badges of these female saints are made with beautiful color pictures - each one encased in plastic and beautifully hand crocheted with a contrasting color thread. Handcrafted in our Monastery. Actual size of the finished Relic Badge is approximately 2½" x 2". Relics are visible on the front of each badge. Badges are individually packaged and include a beautiful matching holy card with prayer, or novena prayer booklet, or prayer leaflet. Relic badges may be carried in one’s pocket or affixed to one’s clothing. They may also be affixed to the clothing of the sick or placed in a room. Requested offerings help with the materials for the badges and in-house printing costs. The enclosed Third Class Relic is a GIFT. We invite you to make your selections from the following badges. The blessed cloth in each badge has been touched to the FIRST-CLASS relic of that saint making it a Third Class Relic. Most graphics are believed and understood to be in the "public domain" unless otherwise noted.